After this I looked, and, behold, a door was opened in heaven: and the first voice which I heard was as it were of a trumpet talking with me; which said, Come up hither, and I will shew thee things which must be hereafter. And immediately I was in the spirit: and, behold, a throne was set in heaven, and one sat on the throne. And he that sat was to look upon like a jasper and a sardine stone: and there was a rainbow round about the throne, in sight like unto an emerald. And round about the throne were four and twenty seats: and upon the seats I saw four and twenty elders sitting, clothed in white raiment; and they had on their heads crowns of gold. And out of the throne proceeded lightnings and thunderings and voices: and there were seven lamps of fire burning before the throne, which are the seven Spirits of God. 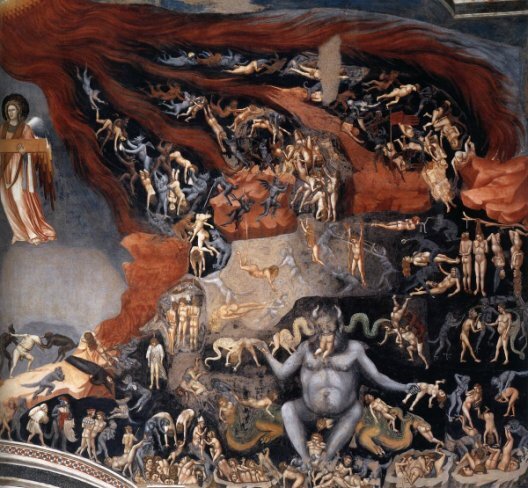 The last judgment is a familiar scene in art. It often features in medieval churches, usually on the west wall or over the doorway, as a warning to the congregation. As I have mentioned elsewhere, hellish scenes no longer have the desired effect , often looking comic rather than terrifying to a modern audience. Van der Weyden's polyptych shows most of the key elements of Last Judgment images. At the bottom, dead souls, reunited with their bodies, are emerging from the ground. Christ is seated on a rainbow as mentioned in Revelation. To the left (Christ's right) the saved are being ushered through a grand gothic gateway. To Christ's left the damned are on their way to Hell. On either side of Christ are various figures: apostles, saints, popes, bishops, kings. The Virgin and John the Baptist are interceding on behalf of souls. Above - an unusual feature in Last Judgement images - angels are carrying the instruments of the passion. Here's a larger version of the centre section. Next to Christ are symbols of salvation, a lily, and damnation, a flaming sword. Below Him, Archangel Michael is weighing souls with his scales. Although Michael is mentioned in Revelation when he defeats Satan (Bk 12 v 7-9) the tradition of him weighing souls does not come from scripture, and it is suggested that the idea comes from a much earlier, pre-Christian tradition, perhaps that of Horus and Anubis from the Egyptian book of the Dead. The trumpeting angels on either side of Michael do have Biblical authority. Revelation chapter 8 describes the effects of the sound of the trumpets of the seven angels, and extraordinarily vivid passage. Van der Weyden only has room for four of the angels. Gabriel is sometimes associated with this tradition. Scholars may argue whether the rainbow in Revelation is a direct reference to Genesis, but it is certainly an appropriate one. In Genesis life on Earth starts again: in the Last Judgment humanity rises from the dead. Some more images. 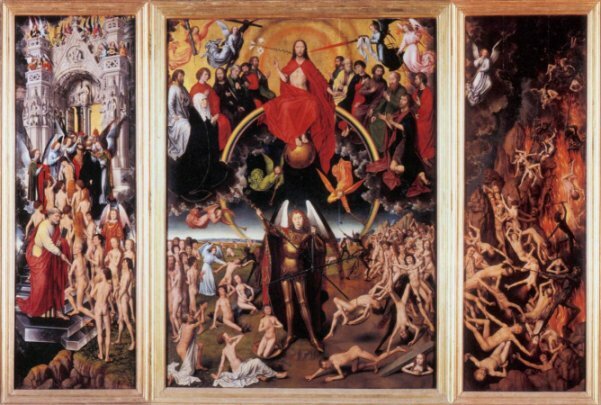 The last judgement narrative is particularly suited to the tryptych format, as in Han's Memling's version. Was he aware of Van der Weyden's polyptych? There are many correspondences. 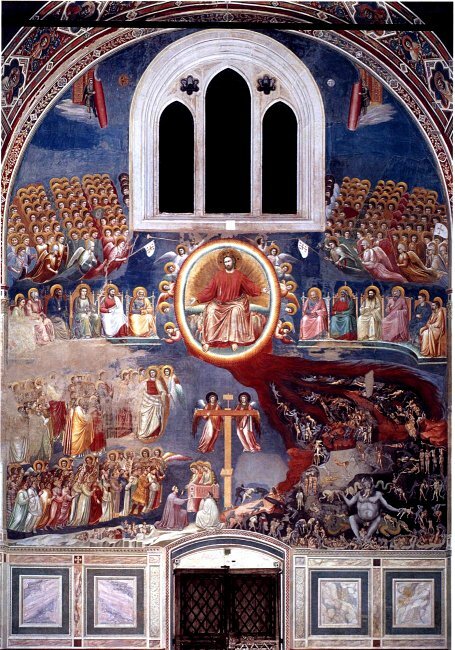 Giotto's west wall of the Scrovegni chapel is a very graphic version, particularly on the side of the damned. Finally, a favourite: the version by Fra Angelico in San Marco, Florence.